Great music on tap for the 7th Annual Mustang Spring Jam. It’s a little under a month to go before the 7th Annual Mustang Music Spring Jam on Sunday, May 20. As aways, the spring jam is held at Mike Dianna’s Grill Room in Corolla. Mike has a great touch with his shows—always manages to bring in some of the best bands around—bands that may not be as well-known as the big names but are putting together some awesome sounds with really talented musicians. This year looks like it’s not exception. The Marcus King Band from Greenville, SC. is headlining this year. The sound is kind of southern rock of the 1970s, but there a bit of psychedelia thrown in touched off by great vocals, hard driving beat and screaming hot guitar. There’s lot’s more as well. All Mustang Music shows kick off with the kids of the Mustang Music Outreach Program taking the stage. Under the direction of Ruth Wyand, these kids rock. Shockingly good and worth coming early just to check them out. There’ll be another local band featured as well. Sense Trails does a great job with reggae music and are worth checking out. Also on tap of the day will be Fireside Collective from Asheville and Of Good Nature from Charlotte, NC. A great quality of all of Mike Dianna’s Mustang Music shows—continuous music. For the Spring Jam, there will be a stage on the deck of the restaurant and a tent with a stage in the parking lot. When one band end, the next one is ready to go right away. 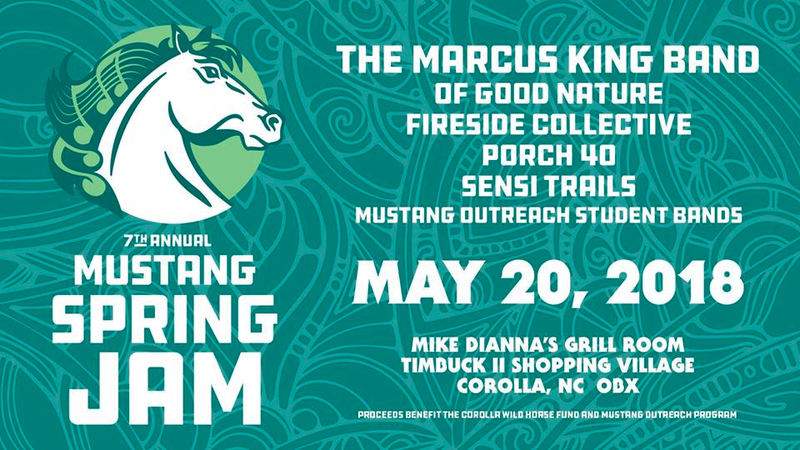 Proceeds benefit the Corolla Wild Horse Fund and the Mustang Music Outreach Program—two great programs that make the Outer Banks a better place to live, work and visit.